At Hillside we mix the best of the old with the best of the new! The home itself is a delightful Grade II Listed manor house. 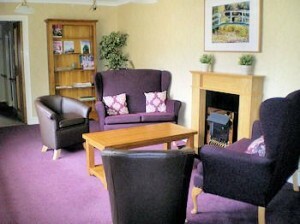 Many of the rooms and communal areas therefore retain the character of the original home. Being situated on a hill, many rooms have views over the bat or of St. James Park and there are therefore gardens at every level: Ground, first and second. This is simply because the home is effectively set back into the hill so that a portion of the higher levels (1 and 2) are still at ground level towards the rear (this makes sense when you see it !). However, we have also just completed a large £2.5m upgrade which has enabled us to design and construct an environment that exceeds the standards you might typically see in many newly built care homes. We are set in the heart of Swansea in the Ffynone Road area overlooking St James Park.